For the past seven years, Denver Startup Week has been a celebration of entrepreneurship and innovation in the Mile High City. The event brings together engineers, designers, marketers, and makers of all stripes to share knowledge, build community, and inspire invention. It’s a massive undertaking, led by more than a dozen volunteer committee members who spend their nights and weekends year-round planning hundreds of sessions, which fit snugly into five days every September. And the DSW organizers do it all on Slack. “Slack has really become the epicenter for organizing Denver Startup Week,” says DSW co-chair Jay Zeschin. 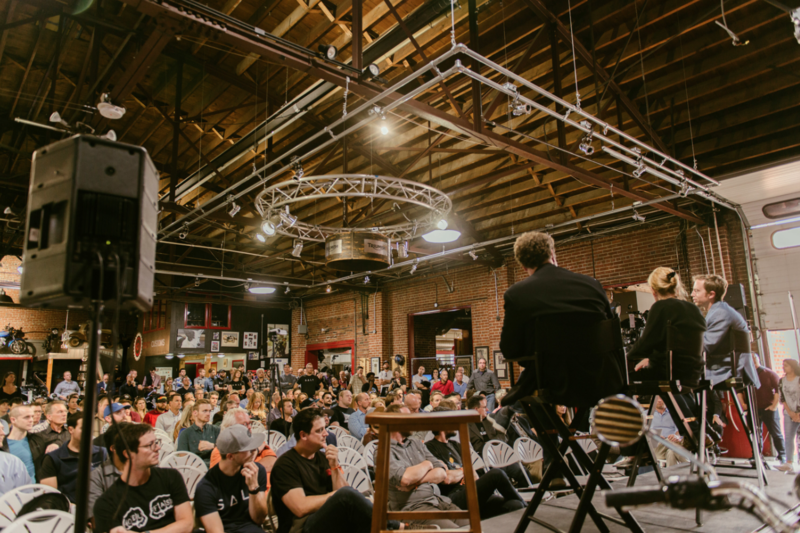 The weeklong schedule of networking and educational events began in 2011, when several Colorado startup founders noticed there was a lot of early-stage innovation in the entrepreneurship community. “But there wasn’t a cohesive sense of identity within that group,” Zeschin notes. Denver Startup Week was the answer—a structured, community-driven space for connecting and sharing knowledge and support. That community, and DSW programming, includes plenty of traditional tech companies; it also features an eclectic range of small, innovative, local businesses that range from ski equipment manufacturers to cannabis retailers. Bringing together so many entrepreneurs in one place also demonstrates to investors and other potential business partners that there is a groundswell of social impact innovation and economic activity in the Colorado capital. And thanks to Slack, organizers have been able to overcome fragmented messaging and improve their record-keeping to make the event bigger and bigger, year after year. To understand DSW’s rapid growth, look no further than the numbers. In year one, 3,500 people attended between 60 and 70 events. Fast-forward to 2018, and DSW attracted over 16,000 attendees and featured 417 free sessions spread across 85 local venues. As Denver Startup Week scaled up, organizers began to experience some natural growing pains. The schedule expanded, and so did the complexity of planning. Committee members are scattered across the city, and different groups were using different platforms and tools to communicate. With so many messages, every text and email started to create a false sense of immediacy. And very few people were receiving the communications most crucial to their role. “One of the biggest challenges was figuring out how we actually get the right information to the right people to either make decisions or communicate updates that need to happen in real time,” explains Conor Swanson, a fellow DSW co-chair. The team chose Slack (a tool many already relied on at their day jobs) to replace group texts and email chains, some of the most unwieldy threads containing more than 400 messages. 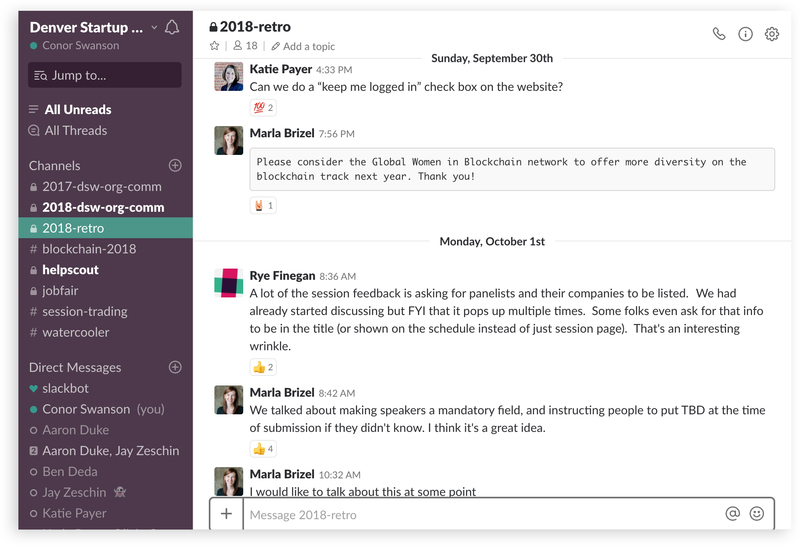 As a much-needed alternative, Slack offers organizers streamlined, searchable communications they can depend on from one year to the next. The stakes compound in the run-up to the actual event, when the core team brings on an additional 1,000 volunteers to help direct traffic and staff event spaces. “There’s certainly been an organizational challenge in figuring out how to effectively onboard and train and establish communication channels for all of those folks in a very short period of time,” Zeschin says. With Slack, the DSW team is able to add or remove users as needed, as well as add or archive channels as the number of volunteers fluctuates and the number of teams shifts throughout the year. Once the DSW team moved away from text message and email chains and into Slack, they began relying on channels to organize nearly all their communication, from monitoring social media and news reports about the event to fielding inbound questions from the community. DSW’s programming is crowdsourced from more than 1,000 proposals each spring. The community votes on their favorites, and through dedicated channels in Slack, the DSW team collaboratively whittle down the list. Their aim: to create a well-rounded program that includes a diverse range of people, companies, subjects, and skill levels. Jump forward a few months to the closing days of September, as the conference winds down, and organizers spin up a retrospective channel (e.g., #2018-retro), where they can log ideas from that year that they’d like to implement the next. “There isn’t anything else like Slack that gives us a live combination of immediacy and institutional memory,” Zeschin says. With such a high volume of attendees and as many as a dozen sessions happening simultaneously across venues, it’s crucial that DSW organizers be able to react immediately to any number of crowd control issues. “Slack works great for problems that come up during the week, especially when we need someone or several people from our large group to address an issue,” says Zeschin. For example, if a venue is close to reaching its fire-code-mandated capacity, organizers can use Slack channels to coordinate routing attendees to another location. To manage and answer individual questions from attendees, DSW integrates Slack with help-desk platform Help Scout to more readily offer eventgoers real-time, on-the-ground customer support. Help Scout routes emails directly into Slack, where the best person to answer the query can easily be identified. With Slack and Help Scout, Swanson says, “we can get the right people pulled into the conversation at the right time.” And that means attendees and panelists get quicker, better answers. That Help Scout integration also logs questions, feedback, issues, and ideas directly in Slack, building a database of institutional knowledge that will carry forward and be able to be easily referenced in future years, as DSW continues to increase in size. Brittany Shoot has written about entrepreneurs and startups for the better part of a decade.